Liquid Pumping System is highly important need of any Manufacturing, Processing, Conditioning and all other type of Industrial, Commercial or Life-Comfort applications. Fluid Pumping Systems, for Thermic Fluids, Oils, Glycol, Coolants etc ideally used for Industrial Applications. Water or Glycol Pumping Systems for Air-Conditioning and Industrial Process Cooling Applications. Integrated Pumping Systems for Closed Loop Cooling Systems for Industrial Cooling Applications. Snowcool System manufactures Ready-to-Install Integrated Pump Skids for Closed Loop Circulation Systems. Our Integrated Pump Skids are equipped with Variable or Constant Speed Pumps, Pump Starters, VFDs, Pump Controllers, PLCs, Display Units, Transducers, Sensors, Expansion Tanks, Air Separator, Shot Feeder (Chemical Pot Feeder), Heat Exchangers, By-Pass Modulating Valves, Suction & Discharge Headers, Butterfly Valves, Suction Diffusers, Check Valves, Pressure Gauges with Siphons, all placed on a common Rigid Base Frame. We use Pumps of Make like Grundfoss, Wilo, Armstrong, KSB, Calpeda, Nanfung etc. The Pump Skid is programmed to save Electric Power and optimize Pump Head & Flow as suiting to Closed Loop System. Variable Speed Pump ensure Constant & Balance Supply of Liquid Flow in each of several number of Processes or AHUs. 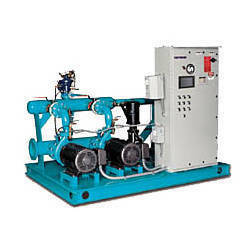 Integrated Pump Skid are usefull for Chilled Water based Centralised Air conditioning Projects, Manufacturing and Industrial Process Cooling via Chilled Water or Brine, and Large Capacity Multi-commodity Cold Storages. Integrated Pump Skids are available from 1CMH to 2000CMH Flow and upto 10 Bar Pressure. Looking for Liquid Pumping System ?